That’s the way of the market. Supply and demand will fluctuate based on price. And price will fluctuate based on supply and demand. When prices become unaffordable, they’ll come down. This week, traders got another reason to second-guess the world’s appetite for high-priced crude oil. In April, demand for Saudi crude oil fell by 17% — its largest one-month decline ever! Demand for Saudi oil and derivatives fell in January, February and March as well. Yes, I’d say that warrants monitoring. It feeds into the rationales for crude oil’s existing sell-off. Nimble traders can profit from short-term sell-offs in crude oil and oil companies. Crude oil’s price action can impact gasoline prices. All else equal, when it costs more to refine a barrel of crude oil, refiners will want to pass that cost onto consumers, and futures traders will drive the gasoline price higher. The price of gasoline futures was rising faster than the price of crude oil. But that changed at the start of June. Now, gasoline is selling off more than crude oil. This is best visualized in what’s called the crack spread. It is a futures contract that compares the price of gasoline to crude oil. When the crack spread is rising, gasoline prices are outperforming crude oil prices. And vice versa. Refining companies want the crack spread to rise. It means the value of their refined product is rising relative to their input costs. In other words, their margins are rising. 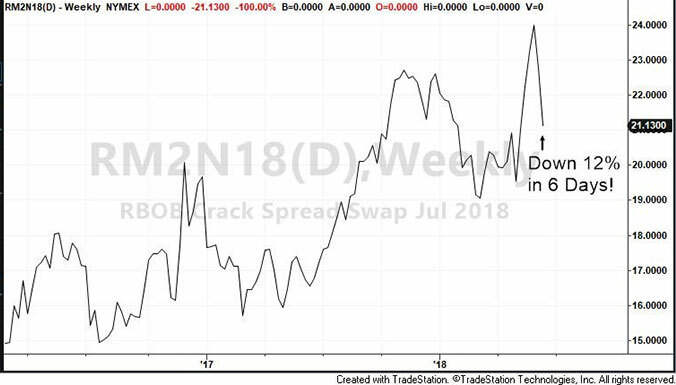 But the crack spread has fallen 12% in the last six days. And investors are reacting. Refiners’ share prices are falling because investors expect their profit margins to fall. Even though crude oil prices will find their footing soon and begin to rise again, gasoline might not. The prime season for gasoline prices is over. Gasoline could still rise with crude oil, but gasoline is less likely to keep pace because its supply and demand rationales will weaken. Refiners will bear the brunt of that. Ready to Bet Against Refiners? The easiest way to trade the crack spread for big, short-term gains is by purchasing the Direxion Daily Energy Bear 3X ETF (NYSE: ERY). It is an inverse ETF designed to move three times as fast, and in the opposite direction, as the Energy Select Sector SPDR ETF (NYSE: XLE).